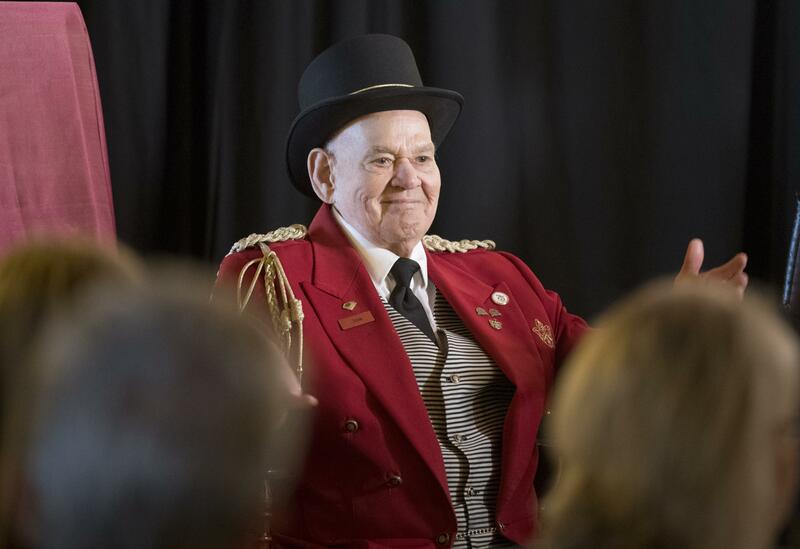 UPDATED: Wed., April 11, 2018, 9:35 a.m.
John Reed, the dapper doorman who greeted generations of visitors to the historic Davenport Hotel during an astonishing 75-year career, has died at age 88. Reed died in his sleep Sunday night or Monday morning at his home in northeast Spokane. His niece, Susan Wilmoth, said he had reluctantly taken the past few weeks off from his job at the Davenport to nurse a foot ulcer, a complication of diabetes. Davenport Hotel owners Walt and Karen Worthy said late Monday they were saddened by Reed’s passing. “Our fondest memories of John were that each time that Karen and I entered the hotel when he was working he said: Mr. and Mrs. Worthy welcome to YOUR hotel!” Walt Worthy said. “John was our go-to person to answer questions about past celebrities that stayed at the hotel and Louis Davenport. Reed never dreamed of retiring from the hotel, where he started working as a bus boy on June 1, 1942. Until recently, he was a fixture at the doors, greeting visitors and passersby four days a week, looking like a ringmaster in his black top hat and red three-piece suit. Wilmoth said the work sustained him. Reed, who grew up in Sandpoint, was just 13 when the hotel hired him. It was World War II, and able-bodied men were in short supply. He made 35 cents an hour, plus whatever tips the waitresses split with him. Reed left for college and returned to the Davenport in 1958, when he started working as a bellman, and he was one of the few employees who stayed through the hotel’s closure in 1985. He watched over the shuttered building until 2000, when the Worthys bought the place and gave it an extravagant facelift. Last year, in an interview with Seattle’s KOMO News, Reed became sentimental when a host asked him why he didn’t leave when the hotel seemed slated for demolition. Reed married his wife, Marjorie, in 1956. They never had children, and she died in 1995, but Wilmoth said he was never lonely. As a doorman, Reed watched several former presidents and celebrities stroll into the Davenport, including John F. Kennedy and George H.W. Bush. And he was the last hotel employee who worked directly with Louis Davenport, who opened the hotel in 1913 and died in 1951. “John was a much-admired colleague and friend, a great role model for all of us at the hotel since he learned the ‘Davenport way’ from Mr. Davenport himself: ‘In all things, consider first the comfort and convenience of the guest,’” said Tom McArthur, who was the hotel’s communications director and historian after it reopened in 2002. McCarthur added that Reed was “a unique primary resource” when questions arose about the hotel’s history. “He had so much history, so much knowledge, and people who loved the Davenport loved to listen to his stories about the Grand Lady,” Wilmoth said, using an old nickname for the hotel that her uncle always used. Reed was honored during a ceremony last June and presented with a 75-years-of-service pin that had to be custom-made just for him. He was also given a new refrigerator stocked with the fixings for his favorite drink: gin and tonic. The mayor shook his hand, and a boardroom in the hotel was named after him. Wilmoth said Reed worked his last day at the hotel in late February and turned 88 on March 6. Employees were told of his death Monday in a letter signed by Lynnelle Caudill, the Davenport’s managing director. Published: April 9, 2018, 10 p.m. Updated: April 11, 2018, 9:35 a.m.